Question 'TestQ' is selected, which is an array dual scale question type. Relevance equation - for complex question and survey customizations. For more details, check the Expression Manager wiki subsection. 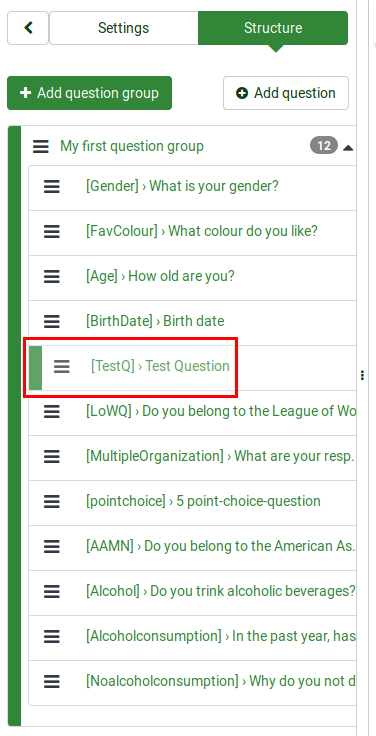 The question quick actions - only the add question to the group box is displayed. Once clicked, you will be redirected to the add question panel. LimeSurvey provides you a menu bar that contains all the corresponding options that can help you edit a certain question type. The options displayed on the top question toolbar. Default answers - sometimes respondents leave the answer field empty. Therefore, if you wish to actually store a default answer within your database, type in here the default answer(s) you wish to be saved. To find out more about each option, please click on them to be redirected to their corresponding wiki subsection. Please note that the available options slightly differ from one question to another. For example, the bar that corresponds to the long free text question differs from the one that corresponds to the array dual scale question type because it does not make use of answers or subquestions. For more details on each LimeSurvey question type, please continue reading the following wiki section.